Elektronische Beats von zwei Schlagzeugern aus Wien. Massive Zebra is a new electronic music project based in Vienna. Going from bright to sombre, the music is epic, punchy and highly dynamic, while allowing room for thought at the same time. The Viennese duo, Michael Plank and Pascal Obermayer, is tied together by their passion for beatmaking, as they are both drummers. Jamming together in 2013 ended up with several tracks and thus Massive Zebra emerged and developed over time. everyday life in the streets of Vienna. 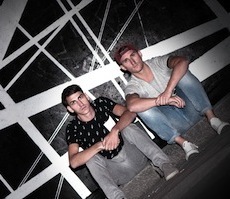 With their raw and dynamic sound, Massive Zebra takes you on a vibrant trip. Unsere neue Single und Debut Musikvideo "Synkope" feat. Performancekünstlerin Maartje Pasman ist ab sofort online! Alpha EP ist ab 01.12.2016 online auf Soundcloud, Bandcamp, Spotify etc. !